Throughout Georgia, one constant element poses challenges to homes, lawns, and gardens: good ole Georgia red clay. Georgia’s infamous soil is a specific class of soil called an Ultisol. Ultisols are known for their rich red color, high density, high acidity, and relatively low mineral content. Red clay is heavy, it clumps together, it produces sub-optimal growth, it stains your clothes – truly it can be a pain in the neck. In many aspects, ultisols are great for building. They are not as finicky when it comes to swelling or shrinking based on water content. They are stress tolerant, giving good support for foundations. However, an area where Georgia red clay causes problems (aside from it being difficult for gardens and lawn care) is that it often presents water drainage problems. One of the most damaging problems that can harm your home’s foundation is improper water drainage. While many states have soil that presents problems with swelling and shrinking, Georgia’s red clay presents the problem of standing water and erosion. When Georgia experiences heavier than normal rainfall, homes often suffer. Homes foundations built on clay soils can often be unequally raised or allowed to settle at different points. Dynamic soil movements and structural foundation design problems combine to cause unacceptable home foundation problems. Because your home rests on its foundation, the foundation of your home must be protected. Hundreds of thousands of pounds rest upon your home’s foundation, and when it is compromised it can lead to huge safety concerns, loss in your home’s value, and even irreparable damage. If you notice water drainage problems around your home’s foundation, it needs to be addressed as soon as possible. If your home’s stability has not yet been compromised, it is essential that you take necessary steps to prevent water drainage problems and foundation damage. If your home’s foundation has been compromised, foundation repairs require a reputable foundation repair contractor to inspect the property and determine the proper methods for correction. 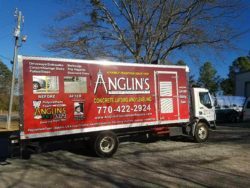 Anglin’s Foundation & Masonry Repair has been in this business for more than 85 years. We encourage you to call us for a free inspection and quote. Our family owned and operated business is built upon client satisfaction and guaranteed results.